Registration of Nikon, Nikoflex and other trademarks. Downloaded from the IPDL, in accordance to the IPDL policies. Nikon is a Japanese company specializing in optics and imaging. Its full name is Nikon Corporation (㈱ニコン, Kabushiki Kaisha Nikon) since 1988. The company was founded in 1917 as Nippon Kōgaku Kōgyō K.K. (日本光学工業㈱, often rendered in English as Nippon Kogaku or, following as different convention, Nippon Kougaku) with the merger of two Japanese optical firms with military connections. The company's first camera lenses were designed in the 1920s by Heinrich Acht, who was invited with a team of German engineers (see Nippon Kōgaku lenses before 1945). After the departure of Acht, the lens design department was taken over by Sunayama Kakuya (砂山角野). The first lens mounted on a camera for civil use was the Anytar 12cm f/4.5 made in the early 1930s, renamed Nikkor in 1932. From 1934, the company supplied lenses to Seiki Kōgaku for the early Canon cameras. During World War II the company expanded significantly, supplying optical equipment to the Japanese military, including various aerial cameras. After the war, Nippon Kōgaku decided to produce cameras for civil use, and two projects were started: a 6×6cm TLR and a 35mm rangefinder camera. 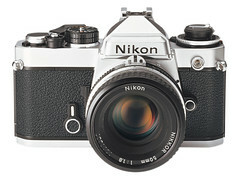 The TLR, called Nikoflex, was shelved because of problems to find an adequate leaf shutter. The rangefinder camera was inspired by the German Contax and Leica. It is said that various names were considered, including Pentax, Nicca or Nikorette. 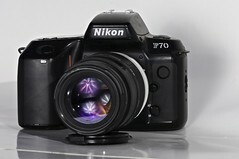 It was finally released as the Nikon in 1948. The Nikon I proved very successful, and was followed by a long line of rangefinder cameras. In parallel, the company produced a range of Nikkor lenses both in Leica mount and for its own rangefinder cameras. The quality of these lenses attracted the attention of many professional photographers and photojournalists desiring better results from the small 35mm format. In 1959, Nippon Kōgaku introduced the Nikon F, an advanced mechanical single lens reflex (SLR) camera that proved to be extraordinarily durable and reliable. With the F, Nikon introduced its philosophy of high-quality, low-friction, close-tolerance mechanisms requiring less lubricant than other cameras.source needed This workmanship had a practical side, as Nikons have accompanied more photographers to extreme environments — from the summit of Mount Everest to the depths of the Saharan Desert — than any other SLR camera. 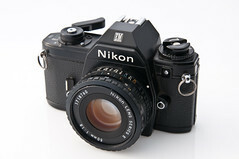 The F became an overnight success with many professional and serious amateur photographers, and spawned a succession of popular Nikon 35mm film cameras, culminating with the Nikon F6. In 1983 Nikon launched the Nikon F3AF, a professional SLR with autofocus together with the autofocus lenses AF 80mm f2.8 and AF 200mm f3.5 ED-IF, a fast portrait lens and a fast tele lens since the camera was designed as kind of press camera. Both lenses had internal AF motors and worked on a slightly modified F-lenses bayonet, thus enabling the usage of manual focusing lenses on the autofocus camera body. 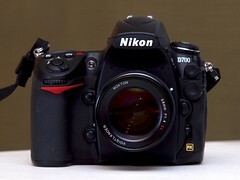 In the mid 1990s Nikon made its first DSLRs, the E-series, expensive cameras producing low image resolution. 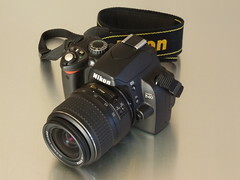 In the late 1990s, Nikon introduced its consumer line digital photography products with both the Coolpix line of consumer and "prosumer" cameras as well as the Nikon D-series (DSLRs). In 2003 the company owned Photonics Technology Group which developed an own kind of image sensors (LBCAST-technology instead of common CCD or CMOS chip-architecture). 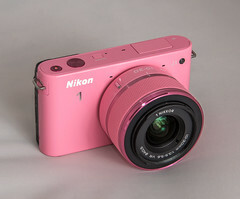 In 2008 Nikon returned to conventional sensortypes with its FX-format CMOS sensor (FX-Format=35mm film frame-format) which it applied in its Nikon D3 DSLR. In autumn 2011 Nikon introduced its mirrorless digital camera system after concurrents Panasonic, Olympus, Sony and Samsung had won big market shares with help of the first and second generation of their mirrorless system cameras, and Panasonic and Olympus even had launched the 3rd generation. The Nikon 1 system uses an own sensor format and special 1 Nikkor AF lenses. For several years Nikon produced the leading edge advanced cameras with 35mm format image sensors in the market. In 2017 the Nikon D850 DSLR took more out of its Sony imaging sensor than concurrent Sony's Alpha A7 R Mark II despite of the Nikon's sensor gave more megapixels, thus needing excessively more technological approach to get out more quality out of its smaller pixel pitch. But in the same year Sony improved its high-end camera to Mark III, probably to make its 35mm format CSC cameras technologically at par with Nikon's DSLRs. See also Kodak for the various DCS models based on Nikon bodies. All Nikon's compact digital cameras with fixed lenses are branded with the Coolpix trademark and are listed together. As with other Japanese manufacturers, Nikon's models were given different names in different territories and formed a confusing array of series, some of which lasted several years and crossed over with others. Below is a list of all the ranges along with some models that defy categorization. see Nippon Kōgaku lenses before 1945, Nikkor and Nikon F lenses. ↑ Rotoloni, Nikon Rangefinder Camera, p.7; "Nikon Rangefinder Cameras" in the Nikon official website. Rotoloni, Robert. Nikon Rangefinder Camera. Hove, East Sussex: Hove Foto Books, 1983 (second edition). ISBN 1-874707-07-3. Hillebrand, Rudolf and Hauschild, Hans-Joachim. Nikon Compendium. Handbook of the Nikon System. Hove (UK): Hove Books, 1993. 198 pages. ISBN 1897802021. Stafford, Simon, Hillebrand, Rudolf and Hauschild, Hans-Joachim. Nikon Compendium: Nikon Systems from 1917. Hove (UK): Hove Books, 2004. 388 pages. ISBN 1897802161. Stafford, Simon, Hillebrand, Rudolf and Hauschild, Hans-Joachim. The New Nikon Compendium: Cameras, Lenses & Accessories since 1917. Lark Books, 2004. 416 pages. ISBN 1579905927. Comon, Paul and Evans, Art. Nikon Data. 500 + cameras, lenses, and accesories. A detailed buying manual a complete pricing guide. Photo Data Research, 1990. 150 pages. ISBN 0962650803. Trademark publication for the names "Nikon", "Nikoflex", "Sphex" and "Parax". The trademarks were applied for (出現) on 5 August 1946 and granted (公告) on 24 February 1947 (no.S22-153 to S22-156). Available in the IPDL trademark database. 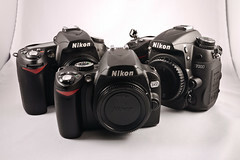 Nikon at Wikipedia, a comprehensive overview of company, history and products. Nikonians, a large Nikon fan site. Nikon Historical Society website "Nikon Journal"